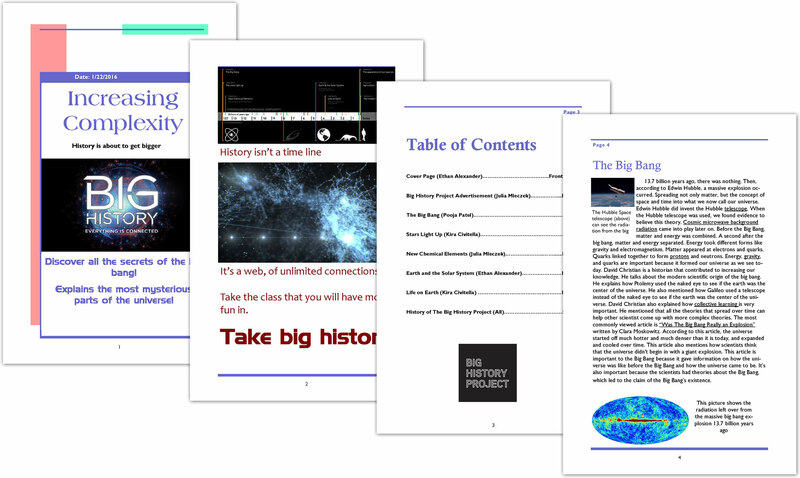 When I started teaching Big History, my biggest challenge was finding a guiding objective for the entire school year—and then deciding how to evaluate student understanding of it. I eventually decided that I wanted my students to be able to tell “the story of us.” Every activity we do in my Big History classroom goes back to the guiding objective: can students learn, and then connect, the information from each threshold to tell “the story of us”? As we approached the end-of-first-semester finals, I didn’t believe a 50-question multiple choice test could fully capture student understanding of this objective. I wanted students to create something that connected not only the material they learned, but also the Big History skills they developed (like interdisciplinarity and supporting claims with evidence). I landed on the idea that they would create a semester-in-review magazine. Here’s what that looks like in my classroom. Feel free to use the assignment and rubric I developed. This finished student example may also be helpful. Whenever I allow students to pick groups, I notice that they gravitate toward comfort—they work with the same people and in the same roles; I’ve found this can mean that not everyone shares the load. Since the magazine activity is an assessment, I know I need to carefully assign groups so I’ll later be able to determine what each student learned. Students have one week to complete the assignment, including three days in class to work. I mention this because I believe this assignment always yields some of my students’ best classroom work! I ask each group to write five articles—one for each of the first five thresholds of the BHP course. In addition to writing about the main concepts and ideas in each threshold, students must also make connections to the “ingredients” and “Goldilocks Conditions.” To strengthen their articles with evidence (after all, claim testing is a core theme of Big History), students must include one journal reference, plus an authority connected to a discipline covered in each threshold. To encourage use of other materials provided on the BHP site, I also have them include five terms from the glossary challenges. Through this project, I learn many things about my students that would not be captured by a 50-question multiple choice test. I see how much they’ve grown over the course of a semester, and how easily they can make connections across course themes by the end. I am also able to see how this curriculum has influenced my students’ views of the world. Of course, when you introduce any lengthy project, there’s often hesitation and anxiety—the first time I introduced the semester-in-review magazines was no exception. But I found that once students jumped into it, they impressed themselves not only with how easy it was to write articles about the thresholds, but also with how much they had learned over the course of a single semester. When they were finished with the magazines, they all took great pride in presenting them to the class! I bring my students’ magazines each year to our eighth-grade parents night so that future ninth graders may better sense what Big History is all about. This is a great tool to use with parents, new students, or administrators who are uncertain about how the course might fit with a world history curriculum. The magazines are visual and virtual examples of the depth of the course content and how students apply the concepts. Most important, they show how much they enjoy the learning process. About the author: Caylan teaches in Rochester, Michigan; this is her ninth year teaching and fourth year teaching Big History. Her two classes of ninth graders receive a world history credit for the year-long class, which meets every day for 53 minutes. Caylan loves that Big History has pushed her to be a better teacher and that it affords her the opportunity to “truly teach” history. WHAT IS ACCRETION AND WHY AM I RUNNING?